So, what happens when, one day you're on the job that you've had 18 years and counting, and you suddenly go crazy? Well, if your name is Mary Beth Shaw, you quit and create a business: Stencil Girl Products - quality artist designed stencils for mixed media artists by mixed media artists. Among the many artists whose stencils are now available are: Sue Pelletier, Pam Carriker and Joanne Sharpe. And guess what: they and Mary Beth Shaw are coming to the Queen's Ink, March 5th & 6th (Wed/Thurs), 2014. The Queen's Ink is delighted to host the very first ever StencilGirl Friendzy at this royal mixed-media retreat. Over the two days, you will work with all four artists/teachers, learning techniques and tricks that will help you carry your stencil art to the very next level. ..and, drum roll please: You will receive four limited-edition stencils, created by each artist and a 58-page 9 x 12 bound journal. Check out all the details here and call the Queen's Ink to register. 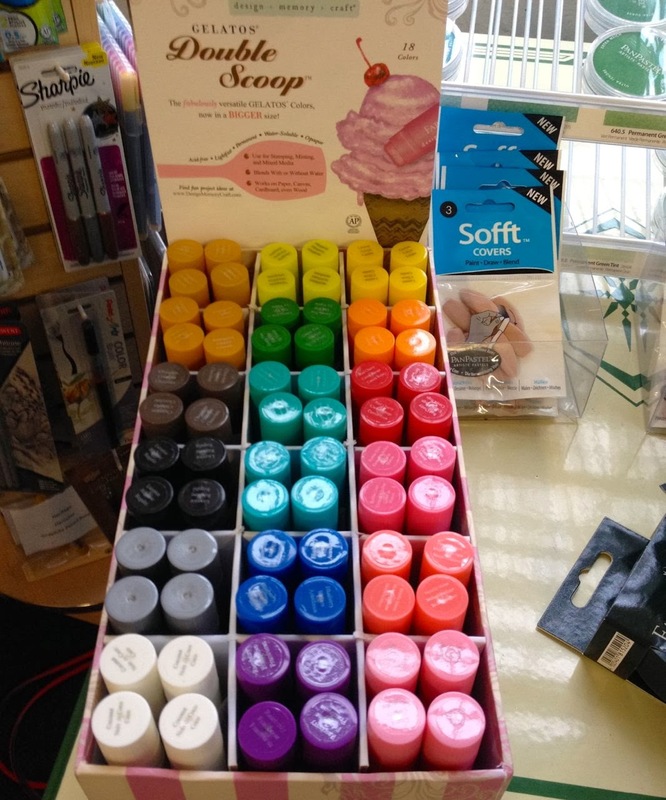 I was in the Queen's Ink Shop Monday and new product from CHA is beginning to arrive…like these luscious Faber Castell Double Scoop gelatos. Yummy! And the shop is expecting new Graphic 45 pattern papers any day now… Be sure to check the Queen's Ink website for up-to-the-minute arrivals of all the new products. Been cold enough for you? I am slowly "thawing out," hoping that our winter weather is soon to be over though I don't have much confidence, considering that all the groundhogs I know (about) saw their shadow three days ago. Not a good sign. But hey, nothing we can do but grin and bear it, pull out our art supplies and drown our sorrows in making great art - in our journals, on canvases, tags, with new paints or a new box of crayons and perhaps a stencil or two. Look forward to seeing you soon. Stay warm.